Davis’ design brings to life the signature flavour of McCafé® Premium Roast coffee and evokes a strong connection to the brand. Now available in major grocery retailers across Canada, the consistently rich, smooth taste of McCafé coffee is even more accessible to consumers. 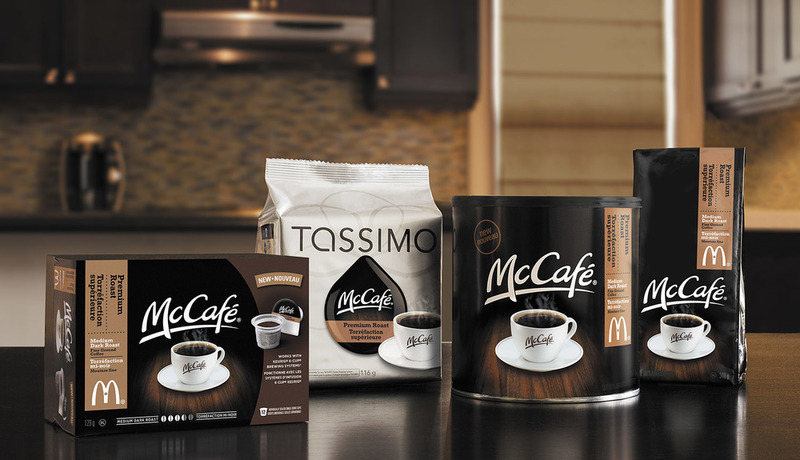 The expanded coffee portfolio includes McCafé Premium Roast ground coffee, as well as on-demand single-serve formats. McCafé’s signature medium dark blend is expressed through rich black tones and dark brown texture. In contrast, the brilliant white McCafé cup creates a singular focus and bold impact on shelf. The consumer information is contained within a simple banner, sealed with the golden arches promise of quality, creating differentiation and ease of navigation. The result is a design solution that reflects Davis’ core value of Dramatic Simplicity. Davis developed grocery channel packaging in collaboration with McDonald’s Canada and Kraft Canada. The Canadian powerhouses are launching 340g and 950g McCafé® Premium Roast ground coffee as well as on-demand single-serve formats. The launch of McCafé Premium Roast coffee in grocery store channels is supported by a large multi-channel advertising campaign now airing, including TV and digital.